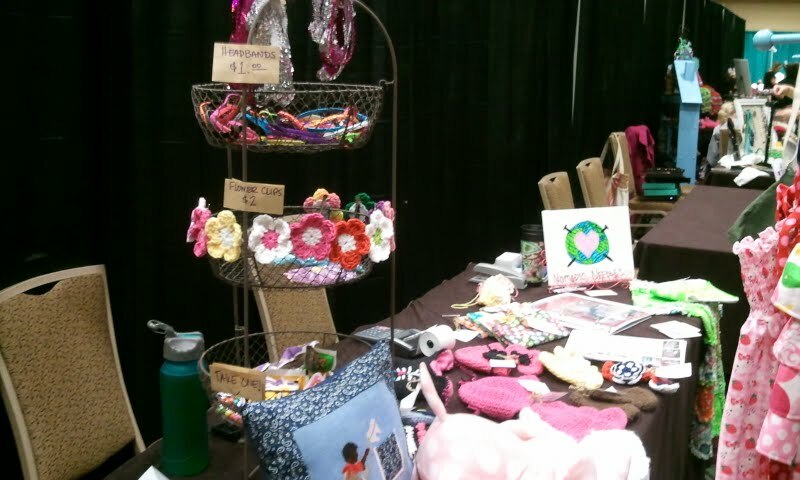 Well it finally came and went, my very first craft show. I have spent so much time sewing and sewing and sewing and trying to build an inventory in 4 short weeks. And although I did not meet my goals as far as amount of inventory, I was pleased with what I was able to bring. The pictures are not great, but you can get the idea. I thought the $1 and $2 bins would be a hit, but I was wrong….and if they weren’t going to pay $2 for handmade flowers with quality clips on the back, well that should tell you how willing they were to buy anything else from me ;). I couldn’t even manage to give away candy to very many people! It was a tough crowd. But it wasn’t all bad. I really did enjoy the day. It was fun to see how everyone else decorates their booths, and takes that 6×6 space and OWNS it! (6×6 is even smaller than it sounds). 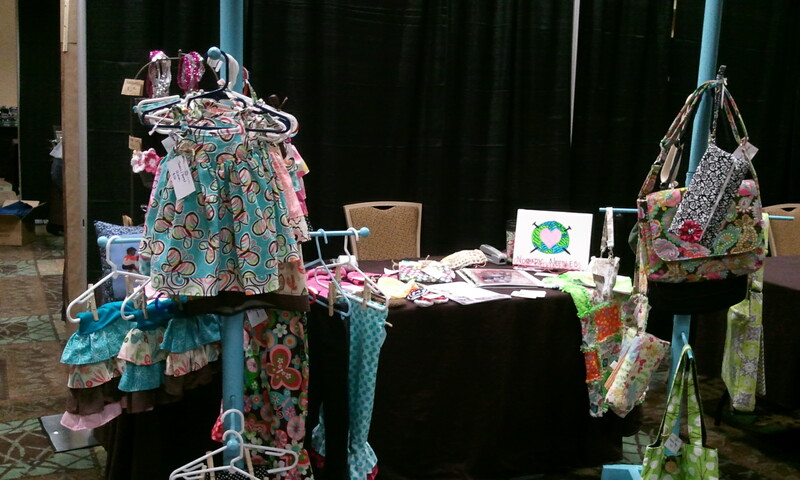 I also got to spend the day with my booth-mate and friend, Minina. We had lots of fun talking and catching up. Her sweet husband brought us lunch AND dessert…thanks Adam! All in all, it was a fun time. We also had the opportunity to meet new people…some that I have admired over the web, like the Owl and the Envelope, and some that had yummy wine and friendly conversations, like Lyndi Rouse ! I even had a guest stop by! Thank you Brandon (my husband’s college roomie and amazingly talented photog) for coming to wish me luck and show off that darling little girl of yours. I wish that I had mingled more and met more of the talented people there. I just felt like a bother walking around staring at their goodies because I didn’t intend to purchase…. well maybe if I had made some money I would have been inclined to spend some. My display worked well. It showed off the goods so that everyone could see everything, no one had to sift through much. Everyone responded well to the clothes and even the purses. I actually had people checking stitches (which is something I secretly do, but pretend I don’t 🙂 ) and were pleasantly surprised that it looked neat on the inside and out. I would like to think of a better way to display the knits. They don’t look nearly as adorable laying flat as they do on a cute little head, or whatever, round 3D object you have….maybe some styrofoam balls would do the trick. We decided that it would also be nice to have a stamp with my logo on it for last minute price tags and for stamping the bags that purchased goods go in. If I were to do craft shows on a more regular basis I would also get a credit card swiper…I think people just enjoy the convenience. One little girl, maybe 7 or 8 yrs old, told her Dad, “hurry I want to go find the ATM noooooowwww”. I got a good laugh out of that one. Aw, I’m sorry to hear that things didn’t go the way they should have for you! It’s ridiculous the prices at which people think crafters should be able/willing to sell their handmade items! (They are always priceless to us.) Try to remember it’s no reflection at all on the quality/value of the things you’ve made. Your creations are truly lovely and one-of-a-kind. Your display is very nice, and you did a great job with it! Keep at it, woman. You’ve got awesome talent! Thanks Marcie 🙂 You are so sweet!! I will be at it again as soon as I find an event will open space!